Inside with the keyboard folded up, showing the LED display module at the top and the chip in the middle. 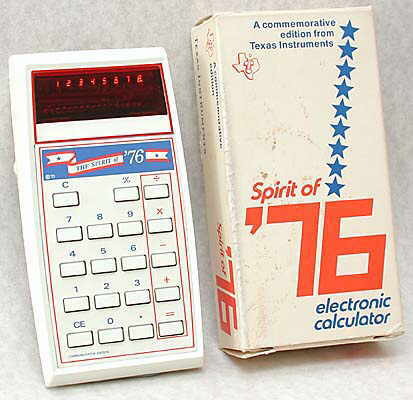 Distinctive features: Special edition calculator to commemorate the bicentenary of the independence of the U.S.A. in 1976. Integrated circuit - Texas Instruments TMC0952NL, here date coded to the end of 1975. 71 x 140 x 34 mm (2.8" x 5.5" x 1.3"). Many commemorative items were produced to celebrate the 200th anniverary of the independence of the U.S.A. in 1976. 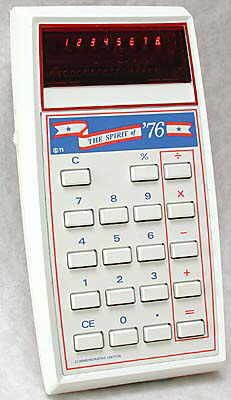 Among them were the Spirit of '76 calculator from Texas Instruments, above, and also the Rockwell '76, pictured on the left. 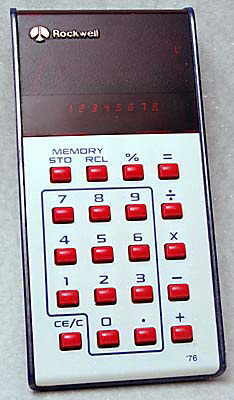 Rockwell '76 bicential commemorative calculator. This is similar to the common Rockwell 18R but is in patriotic red, white & blue.